But I’m not so good at the obedience part. I have an obedience problem, whether it’s to myself, my husband or even God. When I first found out that we were going to be reviewing the first part of Lorrie’s revised scheduling bundle, Managing My Minutes: Do I Really Need To?, I didn’t think it’d be something I would need. I LOVE making schedules. But while she talked about how to actually make a schedule & why its good to have a schedule, what I really got out of it, was the idea that my time isn’t really mine, it’s God’s. It was a whole different mind-set for me and she supported it with so many biblical examples related to different aspects of scheduling and how God feels about it. She refers to biblical aspects for priorities (guess what is first?) as well as getting help! And if you aren’t a scheduler, she shares benefits and objections. Lorrie also shares the difference between schedules and routines and when each is more beneficial. While reading it, I actually did something I never do. I decided to finish cleaning up after dinner 3 nights in a ROW. And I totally didn’t want to; I HATE cleaning the kitchen. But I did it anyway. I even offered it up while I was doing it because that’s what good Catholics do, right? Ahem. So yeah, I’ll be looking for the section on routines when it’s available to see if there is any fine-tuning I can do now that I’ve actually been obedient to my schedule/routine (mostly — it’s a tool, not a dictator). I don’t know about you but I sure don’t want to have to answer to God about why I was able to read 100 novels in a year but my kitchen was a disaster and hubby was annoyed! 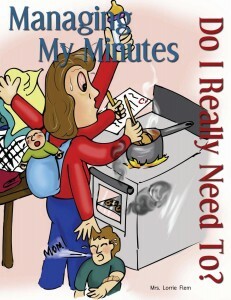 Managing My Minutes should be available soon from Lorrie’s store – Eternal Encouragement. Disclaimer: This ebook was received from Eternal Encouragement magazine as part of their Gabby Mom’s reviewers program.